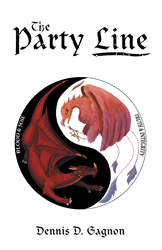 “The Party Line” features dragons, goddesses, and plenty of fantasy packed action as a vehicle for discussions concerning the moral responsibilities implicit in consciousness. In his existential science fiction novel, Dennis D. Gagnon expands upon modern philosophical and scientific themes highlighting the power of the mind—illustrating how thoughts and words do matter and can damage people and society at large if harmful and left unchecked. “The Party Line” tells the story of an elderly man who reflects back to a time in his youth when he discovered a realm of unconscious extrasensory communication that is filled with spiritual teachers, goddesses, dangerous monsters, and conflict. The narrator becomes entangled in an ever-growing presence of damaging unconscious conversations that lead to his friend’s death. Should he avenge that death or deal with it in a more positive manner? In “The Party Line,” readers will uncover an entertaining novel that ultimately reminds them of the incredible power of the mind and the redeeming character of thoughtful action. Dennis D. Gagnon grew up on the coast of southern California and interior Oregon. Dennis has received two Master’s Degrees from the University of California, Santa Barbara in philosophy and economics. He currently teaches philosophy part-time at Santa Barbara City College. Dennis has numerous professional publications in the areas of health economics, biostatistics and psychometrics. “The Party Line” is his first novel. He is currently working on a sequel. For more information about the author, please visit http://www.dennisdgagnon.com.